The European Commission on Monday took the official decision that it no longer considers it necessary to pursue the "trade defense investigation" into Chinese telecommunications equipment. According to a Commission statement, "intensive discussions between the Commission and the Chinese government were concluded by an amicable settlement" on the issue. Settlements were scored in talks on Saturday at the European Union (EU)-China Joint Committee, chaired by EU Trade Commissioner Karel De Gucht and Chinese Minister of Commerce Gao Hucheng. In procedural terms, the investigation concerns the decision in principle made in May 2013 of opening an ex officio anti-dumping and an anti-subsidy investigation concerning imports of mobile telecommunications networks and their essential elements from China. An ex officio trade defense action allows the European Commission to launch a trade defense investigation on its own initiative without an official complaint by the EU industry. The Commission's latest decision on dropping the anti-subsidy probe came after in March this year the Commission repealed the part relating to the anti-dumping investigation. "Together, these two decisions mean that the investigation into mobile telecommunications networks from China will not be pursued," said the Commission statement. 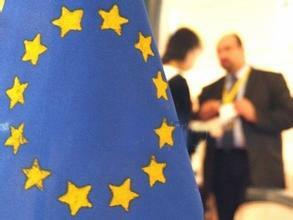 EU Trade Commissioner Karel De Gucht said: "I am pleased that the EU and China have resolved the telecoms case. The concerns that have led us to launch the case last May can now be addressed in a systematic and regular dialogue between the two sides for the benefit of our industry." China exports telecommunication network equipment to the EU market with a value of approximately just over 1 billion euros (about 1.28 billion U.S. dollars) per year. China and the Republic of Korea (ROK) kicked off the 13th round of negotiations for a bilateral free trade agreement (FTA) in Beijing on Monday. The five-day negotiation will cover wide-ranging areas such as tax reductions on trade of goods, opening up of service sectors, further bilateral investment and the possibility of decreasing trade remedies and technical barriers. 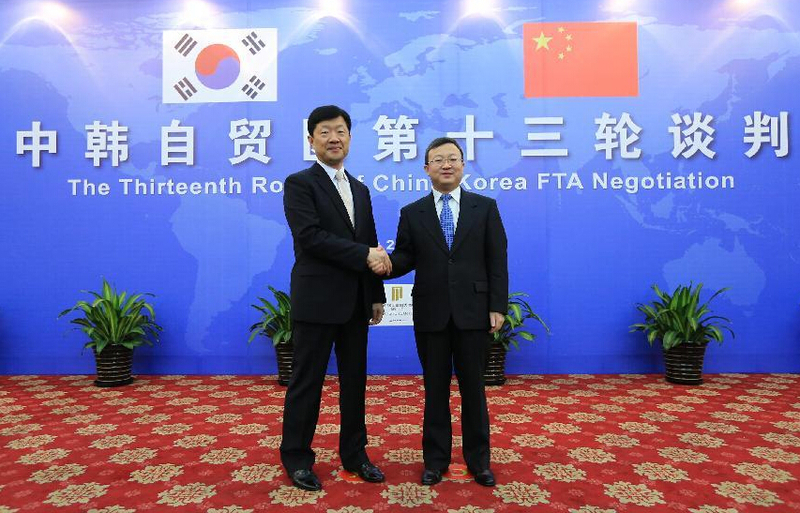 China and the ROK officially launched FTA talks in May 2012. Leader of the two countries jointly announced in July that they would try to conclude the negotiations by the end of 2014. China and the ROK have experienced two decades of booming bilateral trade. Two-way trade surpassed 270 billion U.S. dollars in 2013, nearly 50 times the volume in 1992. 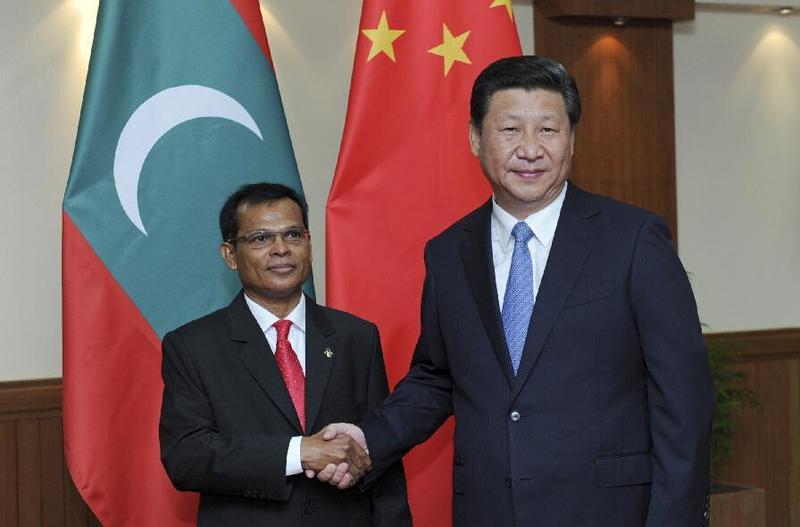 Chinese President Xi Jinping pledged here Monday to share development opportunities with the Maldives. "We will share China's development opportunities with the international community through win-win cooperation in pursuit of common development," Xi said when meeting with Abdulla Maseeh Mohamed, speaker of the People's Majlis, the unicameral legislative body of the Maldives. China will support the Maldives' push for economic and social development as the island country, with its geographic advantages and natural resources, is developing the maritime sector and tourism to improve the people's living conditions, said the Chinese president. Xi arrived in Male on Sunday for a state visit to the Maldives at the invitation of his Maldivian counterpart Abdulla Yameen Abdul Gayoom. On Monday morning, the two presidents held talks and agreed to establish a future-oriented all-round friendly and cooperative partnership between their two countries. Briefing Maseeh on the presidents' talks, Xi said China and the Maldives will expand cooperation in trade, tourism, infrastructure construction and the maritime sector, to jointly build the 21st Century Maritime Silk Road. Xi said he hopes the legislatures of the two countries will increase interactions and play a positive role in enhancing the bilateral relationship. Maseeh said China understands what the Maldives really needs on the path of development, and has been pushing ahead with some major projects and provided the island countries with invaluable support and assistance. Hailing China as a faithful friend and reliable partner, Maseeh said the Maldives will learn from China's development experience and boost cooperation with China. Maseeh said the Maldivian People's Majlis is willing to maintain friendly exchanges with the Chinese National People's Congress to contribute to the bilateral relationship. On Monday, Xi also met with former Maldivian President Maumoon Abdul Gayoom, who is also president of the Progressive Party of Maldives (PPM). Xi said he appreciates Gayoom's contribution to the relationship between China and the Maldives and hopes the former president will continue to contribute to the bilateral ties with his influence. Xi, also general-secretary of the Communist Party of China (CPC), said the CPC is willing to maintain the momentum of exchanges and cooperation with the PPM. Recalling his two visits to China, Gayoom said he is happy to witness the continuous development of the Maldives-China relationship as well as the deepening friendship between the people of the two countries. Gayoom pledged he and the PPM party will keep working to strengthen the relationship between the two countries. It was the first visit of a Chinese president to the Maldives since diplomatic relations were established 42 years ago. The Maldives is the second leg of Xi's ongoing four-country Asia trip, which will also take him to Sri Lanka and India. Chinese President Xi Jinping proposed here Thursday to construct an economic corridor linking China, Mongolia and Russia. 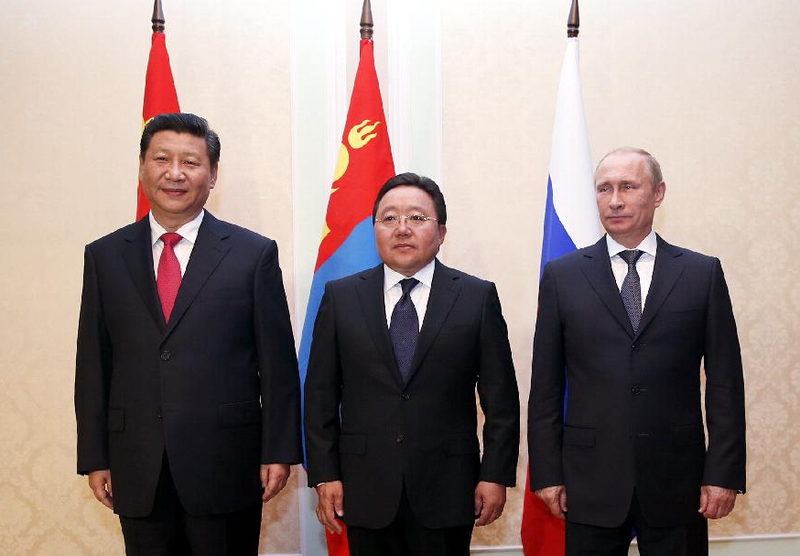 Xi put forward the proposal at a meeting with Russian President Vladimir Putin and Mongolian President Tsakhiagiin Elbegdorj on the sidelines of the 14th summit of the Shanghai Cooperation Organization (SCO). Highlighting that the development strategies of the three neighboring countries are highly compatible, Xi noted that both Russia and Mongolia have positively responded to China's vision on building an economic belt along the Silk Road. The Silk Road Economic Belt initiative, proposed by Xi during his visit to Central Asia last year, eyes a revival of the ancient trade route linking China with Central Asia and Europe. The three countries, Xi pointed out, can dovetail the Silk Road Economic Belt initiative with Russia's transcontinental rail plan and Mongolia's Prairie Road program, and jointly build a China-Mongolia-Russia economic corridor. On building the corridor, Xi called on the three sides to strengthen traffic interconnectivity, facilitate cargo clearance and transportation, and study the feasibility of building a transnational power grid. As part of the initiative, Xi also suggested that the three countries beef up cooperation in such areas as tourism, think tank, media, environmental protection, and disaster prevention and relief. The three countries should deepen cooperation within the framework of the SCO, jointly safeguard regional security, and achieve common development, said the Chinese leader. Founded in Shanghai in 2001, the SCO groups China, Kazakhstan, Kyrgyzstan, Russia, Tajikistan and Uzbekistan. On international cooperation, Xi noted that the three countries need to jointly safeguard the basic norms governing international relations, advocate the new security concept of mutual trust, mutual benefit, equality and collaboration, and jointly promote the political resolution of international disputes and hot issues. China supports Mongolia's participation in regional affairs, said Xi, inviting Mongolia to participate in the activities China and Russia plan to hold next year to commemorate the 70th anniversary of the victories of the World Anti-Fascist War and the Chinese People's War of Resistance Against Japanese Aggression, as well as the 70th anniversary of the founding of the United Nations. Noting that the three countries are good neighbors and partners, Xi said the trilateral summit is of great significance to deepening mutual trust, promoting win-win cooperation among the three parties, and pushing forward regional cooperation in Northeast Asia. He also voiced the belief that the trilateral summit will lay a firm foundation for the development of a closer trilateral relationship. For his part, Putin said the three countries should enhance exchanges, dialogue and coordination. China's Silk Road Economic Belt initiative offers important opportunities for trilateral cooperation, the Russian president said, calling on the three sides to combine their development plans and establish a long-term and stable cooperative relationship in the areas of energy, mining and transportation infrastructure construction. [Exportimes Today] Exportimes： The small class of marketing in the sea has started classes again! [Exportimes Today] Exportimes was invited by the Ministry of Commerce Training Center to participate in the "2018 Sino-US Trade War Situation Analysis and Emerging Market Development New Strategy Exchange Meeting"
[News] Sino-German enterprise independent combination of "intelligence"
[News] The latest news: Trump said prepared to tax 500 billion Chinese goods | Ministry of Foreign Affairs: China is not scared!